Today, we are gathered here to mark the opening of the Chinese Consulate General in Belfast. 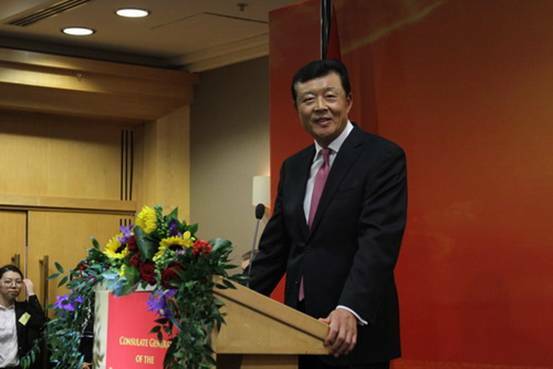 I want to thank Foreign Minister Wang Yi for coming all the way from China. We are honoured to have him to unveil the plaque of the Consulate General. I also want to thank Deputy First Minister McGuinness, Minister Foster and Lord Mayors for joining us today. In addition, I want to express my hearty appreciation to all the representatives of various sectors in Northern Ireland for joining us in witnessing this significant moment. The opening of the Consulate General in Belfast marks the growth of the Chinese diplomatic community in the UK, with the Embassy being joined by three consulates general. The opening of this new Consulate General also marks the beginning of a new era in the relationship between China and Northern Ireland. It heralds a time of all-dimensional China-UK cooperation that extends to every region in the UK. Northern Ireland is an important region with whom China has enjoyed very good cooperation. Recent years have seen growing and deepening exchanges and cooperation between China and Northern Ireland at local government level. Such collaboration links the two sides in economy, trade, education, science and technology. The opening of the Chinese Consulate General in Belfast will meet our mutual needs for expanding our links and partnerships. It is a clear sign of China's high expectations of the growing cooperation with Northern Ireland. 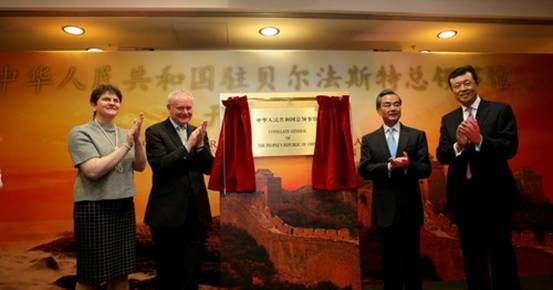 It is, at the same time, a demonstration of China's confidence in peace and stability in Northern Ireland. You have worked hard and your efforts are paying off. You have integrated into the local community. At the same time you have been sharing the best elements of the Chinese culture with the local people and contributing to the multicultural fabric of Northern Ireland. And you also care about the development of China and have supported the construction of your hometowns. The new consulate office will be your new 'hot line' with people back home and your new source of consular services. Much can be gained when you continue to support China's development. And much can be attained when you continue to contribute to the social and economic progress of Northern Ireland. Turning now to the government of Northern Ireland and friends from all walks of life. I want to take this opportunity to express my warmest of thanks. And we will be deeply grateful for your continued care and support. I have every confidence that this new consulate office, led by Consul General Wang Shuying, will do everything within its capability to live up to its duties. I am sure we can all look forward to their excellent work in promoting all-round exchanges and beneficial cooperation between China and Northern Ireland. Today, we open the Chinese Consulate General in Belfast. We are setting up the bellows for China-Northern Ireland exchanges and cooperation. Let us work the bellows. Let us build up the fire and heat up our exchanges. Let us beat "real iron" out. That "real iron" is the win-win cooperation.